In 1999, Asian Association for Sport Management (hereafter called as AASM) was organizing by someenthusiastic scholars from Taiwan, Singapore, Thailand, China, Japan, and Korea. In September of 2002, AASM was formally established in Korea and hosted its historically first annual conference at National Korean Sports University, Seoul, Korea. 1. To encourage and promote original research in both theoretical and applied aspects of sport management theory and practice. 2. To assist in the dissemination of information and knowledge base in sport management. 3. To assist in the development of sport management programs and professional preparation programs for the mutual benefit and progress of AASM countries. 4. To organize or assist various congresses to promote and strengthen the purpose of AASM. 5. To publish proceedings and journals related to sport management. 6. To facilitate and develop relationship among academic institutions in Asia through participation in AASM programme of activities. 7. To collaborate with other associations having similar purposes. Since its establishment, AASM explores its membership nations by degrees. Up to today, the membership nations of AASM contain: China, Hong Kong, India, Japan, Korea, Malaysia, Mongolia, Singapore, Philippine,Taiwan, Thailand, and Vietnam. In additions, there are more and more nations want to join AASM, such as Iraqand Indonesia. Right now, the membership nations of AASM have increased to China, India, Hong Kong, Japan, Korea,Malaysia, Mongolia, Philippine, Singapore, Taiwan, Thailand, and Vietnam. Additionally, AASM Annual Conference has established its reputation; many membership nations are willing to host its annual conferences or EC meetings. Up to today, the annual conferences and EC meetings for the coming years have been arranged, such as 2013 Annual Conference will be in India, one of the 2013 EC Meeting will be in Singapore,the 2014 Annual Conference will be in Taiwan, and the 2015 Annual Conference will be in Malaysia. Although AASM has made progress in its performances gradually, it is still necessary for AASM to analyze the situations which this organization faces with and develops ideal plan to provide better services to its members. 1. To develop the 2012-2014 Strategic Plan. 2. To identify the 2012-2014 EC members from each membership nation. 3. To settle the personnel appointment of 2012-2014AASM Secretariats Office. 4. To publish ASMR for 1 issue. 6. To re-engineer the AASM organization. 7. To identify the policy of membership fees. 8. To find out the target market of AASM. 1. To increase at least 3 nations as new members. 2. To publish ASMR for 2 issues, and AASM e- newsletters for 2 issues. 3. To host AASM EC meeting at least 2 times for per year. 4. The numbers of participants are at least 300 for 2013 AASM Annual Conference. 5. Registration successfully in an ideal nation. 6. To set up the permanent secretariat office in a specific place successfully. 7. To provide the internship opportunity for AASM membership nations’ sport management undergraduate/graduate students. 8. To attend at least 2 area sport management professional organizations and WASM meetings. 2. To start sport facility manager accreditation campaign. In 1999, Asian Association for Sport Management(hereafter called as AASM) was organizing by some enthusiastic scholars from Taiwan, Singapore, Thailand, China, Japan, and Korea. In September of 2002, AASM was formally established in Korea and hosted its historically first annual conference at National Korean Sports University, Seoul, Korea. 7. Collaborating with other associations having similar purposes. Since its establishment, AASM increases its member nations by years. Up to today, the member nations of AASM contain: China, Hong Kong, India, Japan,Kazakhstan, Korea, Malaysia, Mongolia, Singapore, Philippine, Taiwan, Thailand, and Vietnam. In additions, there are more and more nations want to join AASM, such as Brunei, Iraq and Indonesia. Up to today, the annual conferences and EC meetings for the coming years have been arranged, such as 2015 Annual Conference will be in Malaysia, and 2016 will be in Vietnam. Beforethe amendment of AASM Constitution in 2013, there was not a clear definition for AASM’s membership. Only delegates from member nations attended the EC meetings, such as China, India, Hong Kong, Japan,Kazakhstan, Korea, Malaysia, Mongolia, Philippine, Singapore, Taiwan, Thailand, and Vietnam. In 2014, after the 1st EC Meeting, AASM implements its new membership policy with Full Member and Associate Member.In additions, the yearly membership fees also decided as 300 USDs for a Full member and 50 USDs for an Associate member. From 2012-2014, AASM has kept on publishing its official academic journal- Asian Sport Management Review to the 8th Volume. Although AASM has made progress in its performances gradually, it is still necessary for AASM to analyze the situations this organization faces with and develops ideal plan to provide better services to its members. 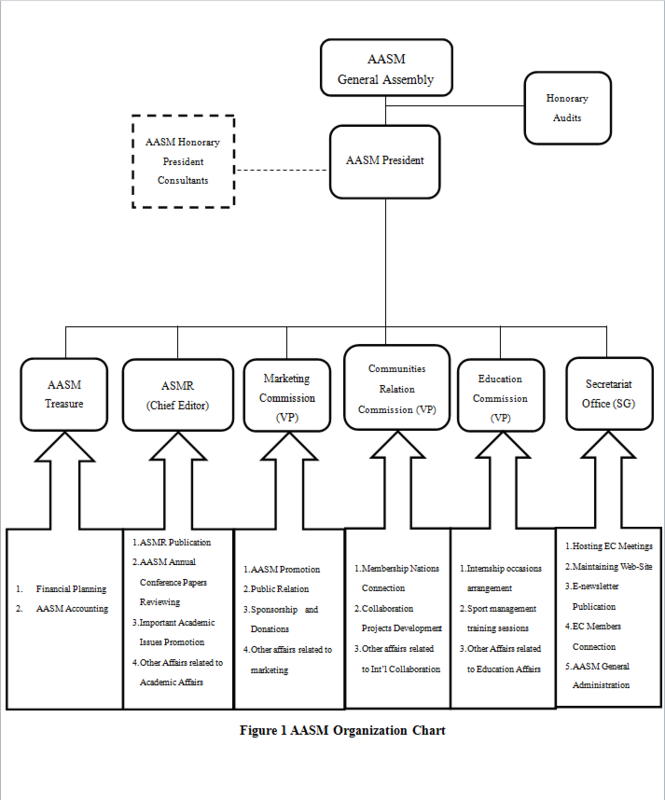 From 2012, AASM Secretariat started to design AASM development plan by analyzing the internal and external environments which AASM faces. This plan has been approved by AASM EC members during EC meetings since 2012. Please refer to appendix I in detail. (1) The amendment of AASM By-laws to Constitution at 2013 AASM 2nd EC Meeting on 25 October, 2013. (2) The establishment of AASM office in Taiwan. (4) Re-defining AASM membership categories to Full Member and Associate Member. 1. AASM acts as a platform for Asian and the other nations’ scholars to exchange their experiences. 2. AASM hosts annual conference as well as EC meetings every year for the representatives from its member nations to exchange their ideas and make contributions to its community. 3. The delegates from the AASM member nations are outstanding scholars within their own nations. AASM delegates have highly cohesions and identities to sport management and AASM. 4. AASM has formed its reputation by degrees. Right now more and more Asian nations plan to join this professional community. 1. AASM is a voluntary organization without any mandatory to its members. 2. It lacks of financial resources. 3. It also lacks of HPR for the secretarial affairs. The staffs of AASM are temporarily assigned by AASM new president for every two years with high turn- over rate. 4. The communication within AASM members is inconvenient. 5. The website is weak (http://www.aasmasia.org/) and lack of maintaining. 6. Not having diversity programs to its members, the main services only annual conference, EC meeting, and ASMR publication in every year. 7. English is not the first language for the majority of Asian nations, which discourages main Asian sport management professionals to attend AASM related events and submit their manuscripts to ASMR. 8. The policy and culture background in Asian nations are different which adds the difficulty for AASM to promote sport management professional discipline in Asian nations by using a single way. 9. The official of AASM academic journal-ASMR is not so aware by the sport management researchers internationally. 10. Without much identity to the young professionals within the Asia area. 1. There are many other Asian nations do not join AASM as a member yet. 2. Many Asian nations want to promote sport management in their regions. 3. Asian is quite a diversity culture area and attracts many people around the world. 4. Sport industry is more popular around the world. 5. Thediscipline of sport management has many common issues both in academic research and practical operation in many Asian nations. 6. WASM was set up in May of 2012, which generates a chance for AASM to have more collaboration opportunities with non-Asian area because AASM is one of WASM members. 7. The increased common demands of sport management professional accreditation in Asian nations, such as facility managers, event mangers, etc. 1. There are some other organizations in the field of sport managementhas established in Asia area, such as Asian Sport Industry Management Association. 2. Some experienced and senior members drop from AASM EC due to AASM by laws and won’t come back, even endow him/herself to other competitive organizations. 1. To raise the value of AASM. 2. To reinforce the functions of AASM organization. 3. To make good use of AASM HPR. 4. To explore the revenues. 5. To increase AASM member nations. 6. To find out AASM’s market segmentation. 7. To reinforcethe producing of AASM publications. A. Making survey to all of AASM members to identify the demands of them. B. Improving the official website; adopting modern tech., such as APP. C. Words-of-mouth separated by EC members or AASM events participants. D. Attending important international conferences by AASM representatives to introduce AASM. E. Trying to implement new and valuable events or projects to create more services to AASM members. A. Inviting famous Asian as well as otherintercontinentalscholars to join the edition committee. B. Encouraging the annual AASM Conference outstanding research awardees to submit their papers to ASMR. C. Introducing new issues to AASM colleagues. D. Collaborating with famous publishers, such as Human Kinetics. A. Keeping contacting to members all the time. B. Providing more information to members, such as e-newsletters. C. Sharing the local news/events related to the individual member nation. D. Maintaining the AASM official website all the time. D. Creating collaboration activities with other organizations. A. Providing more occasions for the scholars from the member nations to exchange their experiences, such as inviting them to join AASM various commissions. B. Finding important information for AASM colleagues to collaborate to one another. C. Signing MOUs with AASM member nations. A. Set up AASM important sport management professional accreditationsystem which meets the demands of AASM member nations. B. Introducing the system to AASM members. C. Encouragingand help AASM member nations to set up their own sport management professional accreditation system. D. Having a joining collaboration agreement of the certificate recognizing with the member nations that already have and promote the certificates in their own countries. E. Cultivating ideal AASMmembers as the lecturers for the training session of this accreditation system. F. Accompanying with the AASM lecturers to promote the importance and marketability of this certificate within their own nations and the area of Asia. A. Contacting the individual member nation (Full Members/ Temporary Full Members) delegates and Associate Members. B. Pool these active members into a list. C. Informing them to attend the coming AASM related events. A. Finding all the persons who have been the EC members during the last 10 years. B. Contacting these persons for further collaborations. C. Assigning these persons with specific tasks related to AASM affairs. (3) To retain experienced officials in AASM. By the same method as mentioned above. (4) Assembling AASM experts to produce a unique active sport event to portray the character of AASM professional image.—AASM Cup. A. Developing an internship policy of AASM. C. Accepting the applications from the applicants. D. Starting the applicant’s internship work. (1) To design the formula of AASM membership fees(Treasurer and Secretary General). A. Judging the fix costs of AASM. B. Judging the variable costs of AASM generated from different occasions. C. Judging the potential revenues. D. Identifying the break-even point. E. Setting up the amount of membership fees. By: Assigning the Marketing Commission to deal with this work. By: Assigning the Community Commission to deal with this work. (1) Inspiring AASM members to introduce non-member nations’ scholars to join AASM related events. (2) To find out ideal persons from non-member nations to attend the AASM related events by using the AASM official website advertising. B. Identify the demands of AASM customers. (2) To identify the market segment with other similar organizations. By:Comparing the contents of the missions and finding out the differences from AASM with other competitors. (1) The publication of ASMR constantly. C. Finding the outstanding presenters of AASM Annual Conferences to submit their papers. (2) The re-publication of AASM e-news. By: appointing Secretariat Office to deal with this work. 1. To increase at least 2 AASM member nations. 2. To publish ASMR for 2 issue, and AASM e- newsletters for 2 issues..
3. To develop the 2014-2016 Strategic Plan. 4. To form 2014-2016 AASM service task forces. 5. To identify members demands through survey. 6. To host at least 2 EC meeting. 7. To host 2015 AASM Annual Conference. 8. To have collaboration agreement with at least 1 of AASM member nation. 9. To attend at least 1 area sport management professional organizations and WASM meetings/conference. 1. To increase at least 3 nations as AASM new members. 4. To attract at least 250 participants for 2015 AASM Annual Conference. 5. To attend at least 1 area sport management professional organizations and WASM meetings/conference..
6. To start sport facility manager accreditation campaign. 7. To provide the internship opportunity for AASM member nations’ sport management undergraduate/graduate students. July, 2014 All To implement the 2014-2015 Strategic Plan. July, 2014 All To form 2014-2016 AASM service task forces. December, 2014 Secretariat/Community Relation To identify members demands through survey. All Year Secretariat To host at least 2 EC meeting. October, 2014 Community Relation To increase at least 2 member nations. December, 2014 Community Relation To have collaboration agreement with at least 1 of AASM member nation. All Year Community Relation To increase at least 3 nations as AASM new members. All Year Secretariat To host AASM EC meeting at least 2 times for per year. All Year President/Honorary President To attend at least 1 area sport management professional organizations and WASM meetings/conference. January, 2016 Education To start sport facility manager accreditation campaign. All Year Education/Marketing To provide the internship opportunity for AASM member nations’ sport management undergraduate/graduate students. All Year Community Relation To have collaboration agreement with at least 1 of AASM member nation. The financial year of 2014-2015 is to attend a break-even status. The fix costs will be covered from the incomes of Membership fees and Donation and Sponsorship, this amount are 5,400 USDs. The Variable Cost comes from 2015 AASM Annual Conference, it will be covered by the registration fees and Organizing Committee other incomes Please refer to Table 4. The 2015-2016 financial management policy will follow the last year’s policy and try to improve AASM financial situation. The variable costs may be covered from the registration fees and Organizing Committees other incomes and make the financial surplus for 4,000USDs. For the fixed costs will be covered by the incomes form membership fees and donations and sponsorships and also generate a surplus for 900 USDs. Therefore, the anticipated financial surplus will be 4,900 USDs. Please refer to the following table in detail.